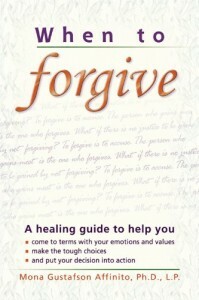 For further discussion or help, please take a look at my two “Forgiveness” books. 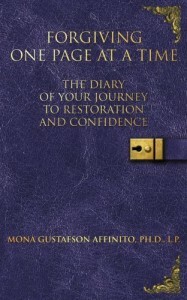 I’m including one testimony here to offer hope that they are helpful, maybe in a way that might surprise you. As the testimony suggests, “When to Forgive” or “Forgiving One Page at a Time” will provide the opportunity to work through your own process and come to your own decisions and actions. Order through amazon.com, or directly from me, especially if you’d like a signed copy. Even more important, perhaps, I’m offering limited copies of “When to Forgive” directly through this site at the original price of $13.95. Forgetting definitely is the key to fogievenrss. Without it , itb4s not really fogievenrss. I really think itb4s the reason a marriage can work too. Sometimes having a bad memory works in our favor! It seems the longer I am married the shorter memory I have! hehethanks for your encouraging comments about the chores. I am working up to having them help with laundry. It would be a wonderful help. They do sort the dirty clothes and fold clean clothes. I run the machine at the moment but when asked they do their part. It would be great if they could get to doing it without me asking. The first one absolutely not. The second is possibly leaving room for forgiveness in the future. Sometimes it takes years.